An electron and positron have identical mass with accuracy to many decimal places. An electron and positron have differing by a sign an identical charge with accuracy to twenty decimal places. This means that trails of these particles in a cloud chamber should be mirror reflections. 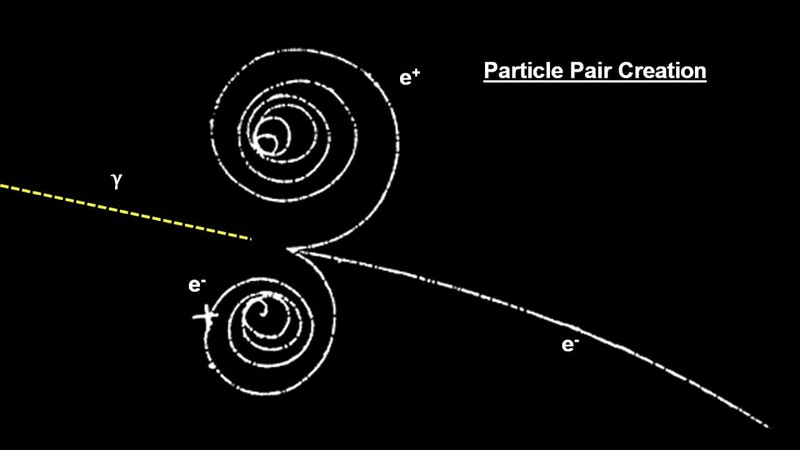 However, the trails of an electron and positron in a bubble chamber vary in sizes just like the trails of David and Goliath (see Figure 1). Figure 1 Trails of an electron and positron in a bubble chamber. – there have to be significant differences in their structures and physical properties causing this effect. This means that the problem of different trails of an electron and positron in a bubble chamber can be solved when we have a concept of construction of an electron and positron and we know in which medium they move. The modern physics does not have such a concept and knows nothing about the existence of the world of energy quanta, so it explains the above problem from its point of view in the following way. The produced positron has a greater kinetic energy because, as a result of Coulombic interaction of the created pair with positively charged nucleus protons, the positron gets accelerated and the electron gets restrained. This explanation is false. In an atom, each nucleus proton already interacts in a Coulombic manner with a corresponding electron of the atom (is neutralized), therefore no proton can interact in this way with external electrons or positrons. The problem presented above is explained by Model 31 in the following way. 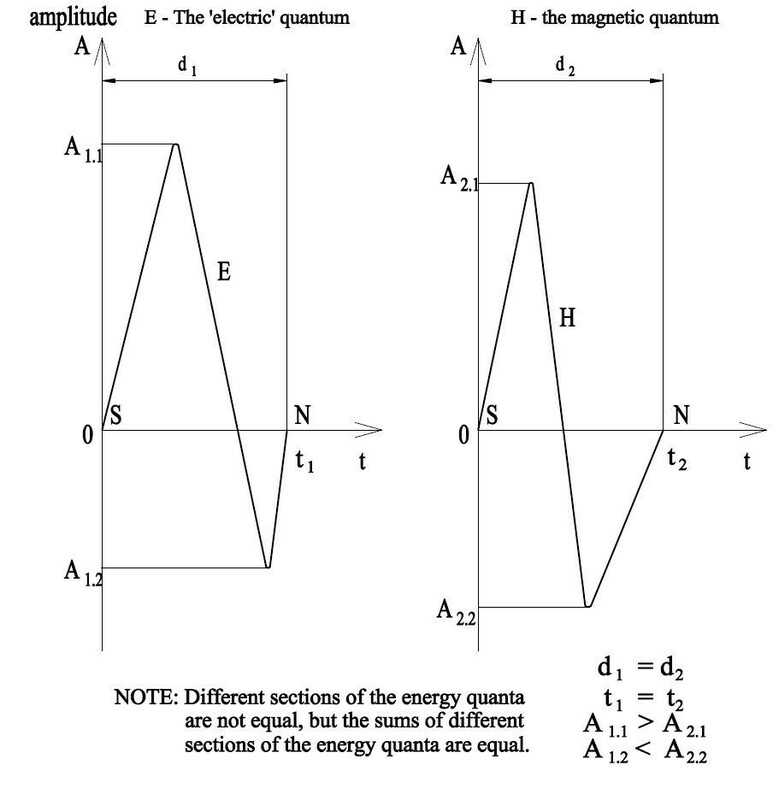 As shown in the main elaboration, pairs of electrons in an atom emit pairs of energy quanta which immediately form a complex, double quantum connected with the magnetic poles (see the figure below). Each complex quantum is a precursor of an electron-positron pair. Such a complex gamma quantum with an appropriate frequency of vibrations (power), after a collision with the nucleus of an atom, electron, or another quantum, will decay into two individual quanta (see Figure 3). These individual quanta are made of a string of energy with the same length but their internal structure is different (see Figure 4). Figure 4. 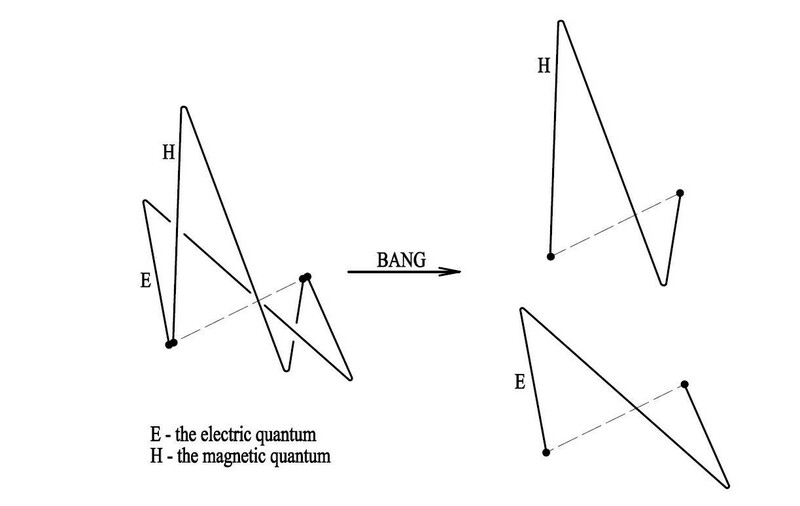 Construction details of an electric quantum (E) and magnetic quantum (H, B) forming a complex quantum in Figure 2. 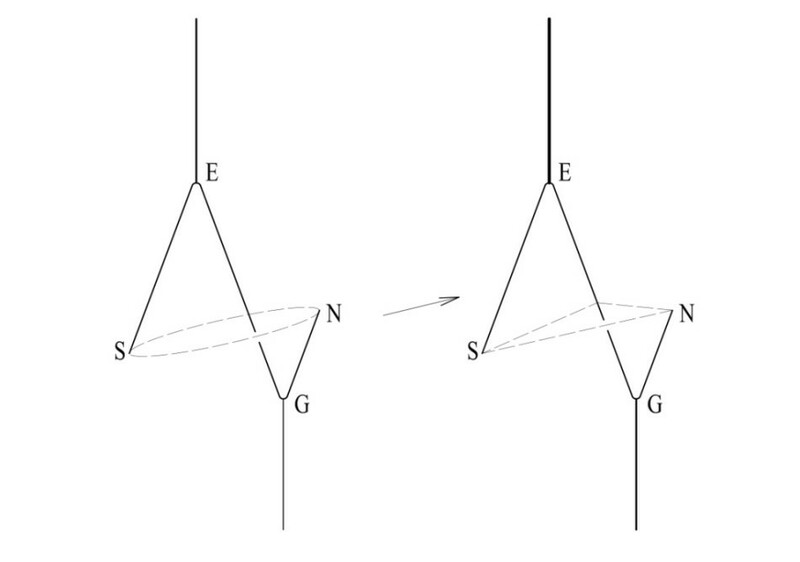 The difference is that their magnetic poles of the same sign are made of energy strings of different lengths, which means that they vibrate with various frequencies, which, in turn, means that they can attract each other, that is they can make complex quanta in the way presented in Figure 2. If these simple quanta have an appropriate frequency of vibrations (power), immediately after their appearance they will turn into a positron and electron, as presented in Figure 5. The construction details of an electron and positron made from a complex quantum presented in Figure 2 are shown in Figure 6. It is apparent from the above that there are significant differences between the structures of an electron and positron. 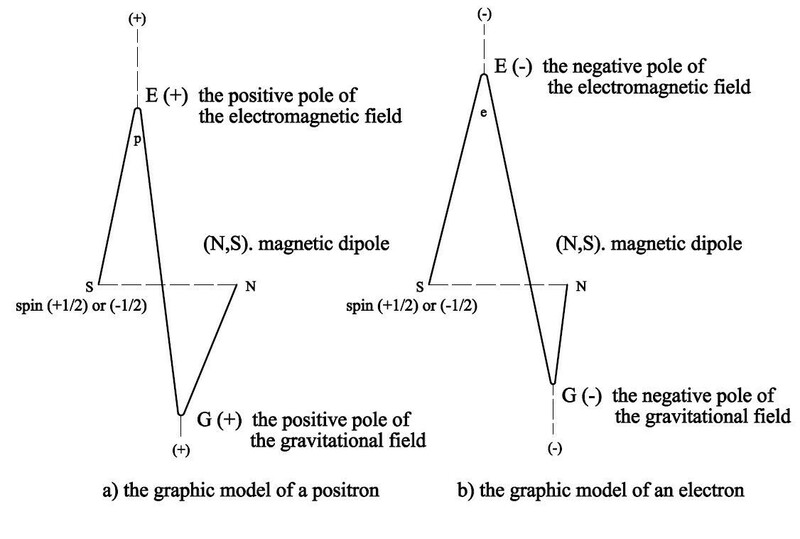 These structural differences make their individual vertices E, G, and N-S vibrate with various frequencies, thus producing different value (positive and negative) lines of the electric, magnetic, and gravitational field. 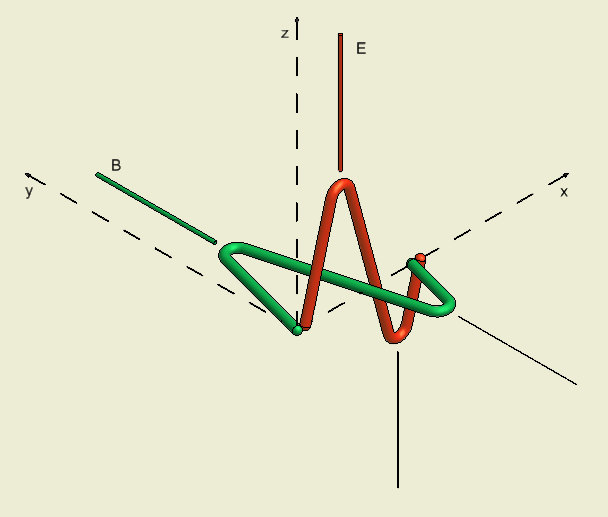 Differing in structure, an atom and positron move in the magnetic field in opposite directions with progressive, fading spiral motion, as seen in Figure 1. These particles moving in quantum gas are subject to various resistance to motion, which results in different sizes of their spirals in a cloud chamber. The spiral of a positron is much greater, which means that its structure (size, shape) causes less resistance to motion in quantum gas than resistance to motion of an electron. An additional proof that an electron and positron are different in structure can be a different distribution of beta minus and beta plus radiation of copper atoms 64Cu.